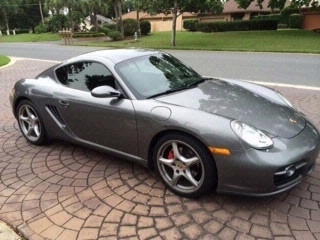 08 Cayman S, excellent condition inside and out, sport exhaust, sports chrono package,19" Carrera wheels, meteor grey metallic, Bose sound with kenwood head unit including navigation, i-pod,bluetooth, Dvd, etc., new rear michelin sport tires and fronts are 80%, All body panels checked for paint work with paint meter and showed no evidence of any paint work, The car fax shows 2 previous accidents however, the only damage was to the rear bumper which has been repainted. Fresh oil service with synthetic mobil1 oil just done. This car runs and drives great.